Femvertising: Friend or Foe to the Women’s Rights Movement? How brands exploit feminism in advertising and how companies can be part of the solution. Marketers have a tendency to give things clever names. We’re really good at it. Sometimes we do it for brands: “dependability” was invented for Dodge automobiles, and “drinkability” was created for Budweiser beer. Often, we assign jargon to our own industry, perhaps in an attempt to boost our credibility, or simply because we can’t help ourselves. One newer term that has emerged in the last 10–15 years is “femvertising”. It’s what we now call advertising that uses the themes of feminism. Many brands have hopped on this bandwagon as the modern-day women’s rights movement gains prominence in our public narrative (see conversations about #MeToo, equal pay laws, and the Women’s March). What’s more, this tactic engages more than women consumers. It seeks to strike a chord with all Millennial consumers (and their $30T of spending power), who prefer brands associated with a cause. On the surface: this is great! Affecting public dialog is, of course, the power of advertising. So, shouldn’t we celebrate the use of feminist messaging in advertising? Not quite. The relationship between women and advertising is… complicated. 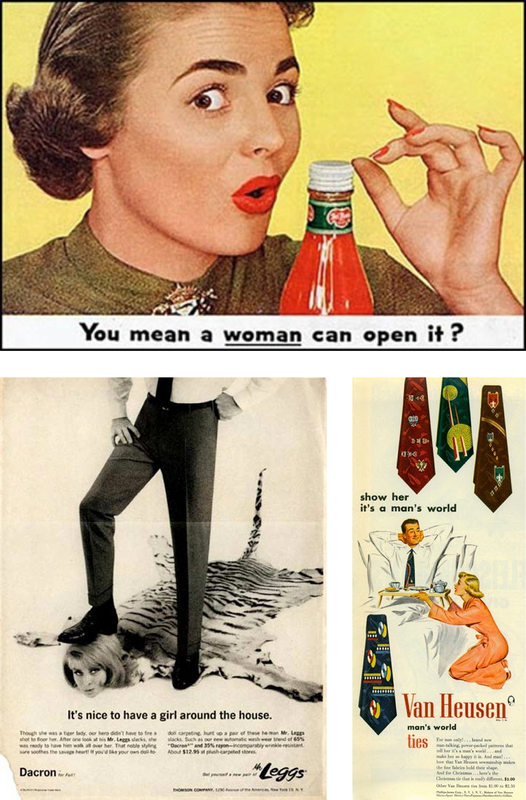 Kilbourne studied advertising intended to sell products to women since the 1960s and found that many degraded, dehumanized, and otherwise objectified women. Kilbourne found that ads like this create the kind of environment in which violence against women is not only accepted but normalized. It creates pressures to be young, thin, and beautiful, for men to be bigger than they are in real life and for women of color to fit the white ideal. Most advertising to women historically perpetuated these impossible ideals and unrealistic standards. It did very little to advance the notion that women are equal to men in society and should be treated with respect. Femvertising, unfortunately, is no better. State Street Global Advisors’ commissioning of the Fearless Girl statue. State Street recently settled allegations worth $5M that it paid women and black executives at the firm less than their white, male counterparts. KPMG’s video spot about women breaking the glass ceiling. KPMG faced a $400M class-action lawsuit that alleged a pattern of gender discrimination, including denying promotions to women and penalizing them for taking maternity leave. Pantene’s ad imploring women to stop apologizing. Dove’s “Evolution” campaign questioning society’s standards of beauty and “Campaign for Real Beauty” stemming from the success of “Evolution”. Dove’s pioneering Campaign for Real Beauty started a conversation about these beauty standards for many, but parent company Unilever ran these ads around the same time as those misogynistic Axe travesties that reduced women to horny playthings, lusting after men wearing the body spray (something they have pledged to discontinue). Same company, with vastly conflicting stories. Most Femvertising is unintended exploitation. Now, as a marketer myself, I assume the right to assign monikers to our industry. So, I call this “faux-feminism”: it’s the exploitation of feminism by advertising. These ads do nothing to empower women. What they do is exploit the women’s rights movement at a time when it is gaining popularity and sits in the spotlight. On the surface these brands wear feminist ideals, but at the core they embody something vastly different. What’s worse, they are doing it at a time when women’s rights are anything but guaranteed under our current elected officials, and around the world. So what? Here’s the danger of Femvertising. I believe in the power of marketing, and I believe there is a real danger to feminism if we accept this trend of femvertising without holding companies accountable. Femvertising essentially gives companies an out from doing the hard work of really supporting women. It grants companies the brand equity of one that supports women simply because they use such girl-power messaging in their ads. If we accept this hypocrisy, we dangerously create an illusion of progress without gaining any ground. Many who see these spots think the world is more fair, and equitable, than it truly is. And we simply can’t deal with a problem we don’t see clearly. What brands, and consumers, should do. Great marketing is based in truth. It reflects the values of a company, and values cannot be faked. (You can’t bullsh*t your way to authenticity.) Not only are consumers are smarter, but the stakes are also higher. To help, I developed a litmus test for all of us. I recommend brands take this test before deploying themes of female empowerment in your marketing to determine whether your company can indeed herald the notion of supporting women. I recommend consumers evaluate Femvertising campaigns against this simple yes-or-no test to determine whether or not to support that brand in their efforts. If you answered mostly “no”: This is paying lip service to feminism. It falls into the category of “faux-feminism” and a gimmicky marketing campaign meant to cash in on the women’s rights movement by earning free press. If you’re evaluating your own firm against this checklist and reach mostly “no,” it’s likely best to pursue another narrative in your campaign. If you answered mostly “yes”: Fist bumps all around. This is a champion of women’s rights, a company putting their money where their mouth is and creating real change in the world through their actions. They deserve to be celebrated for using Femvertising to grow their brand equity and awareness. One great example of a company walking the talk is, aptly, Jane Walker, the campaign from Diageo on International Women’s Day that temporarily changed the Johnnie Walker icon to a female version (Jane). On the surface it first seemed like lip service (see Melissa Ward’s excellent takedown of McDonalds flipping its Golden Arches), but, looking further, Johnnie Walker’s support of women extended into the real world. The company donated portions of its sales to organizations that support women’s progress, they joined the CEO Action for Diversity and InclusionTM, they boast a vocal woman CFO who is clear about the importance of inclusion at the organization, and the makeup of both their board and blenders is nearly half women. You can read more about the campaign in my article on LinkedIn. Although many brands exploit feminism in advertising, it’s clear that companies can be part of the solution. It’s not only good business to do so, but it’s also critical if we are to protect the integrity of the women’s rights movement. Consumers, you can “vote with your wallet” (to use a term I heard from Shannon Coulter of Grab Your Wallet) and use resources like LedBetter and Gender Fair to determine which companies truly support women — and which contribute to the dangerous, gimmicky illusion of progress. For more resources on Femvertising, visit my resource center. Katie Martell is an on-demand marketing strategist based in Boston, MA. Every week Katie sends out The World’s Best Newsletter - interesting links on marketing, business, and life. It’s free & curated by her. Get on the list.